The child items are shown when the mouse is over the parent. The child items are shown when the user clicks on the parent. This behavior of the RadMenu control can be controlled via the ClickToOpen property. 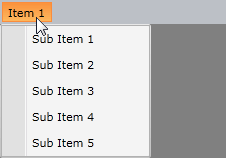 The default value is False which means that the child items are displayed upon a hover action. 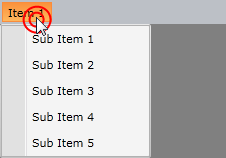 Setting the property to True will make the child items appear upon a mouse click on their parent. Note that the children do not automatically hide, but they will wait for a mouse click again.